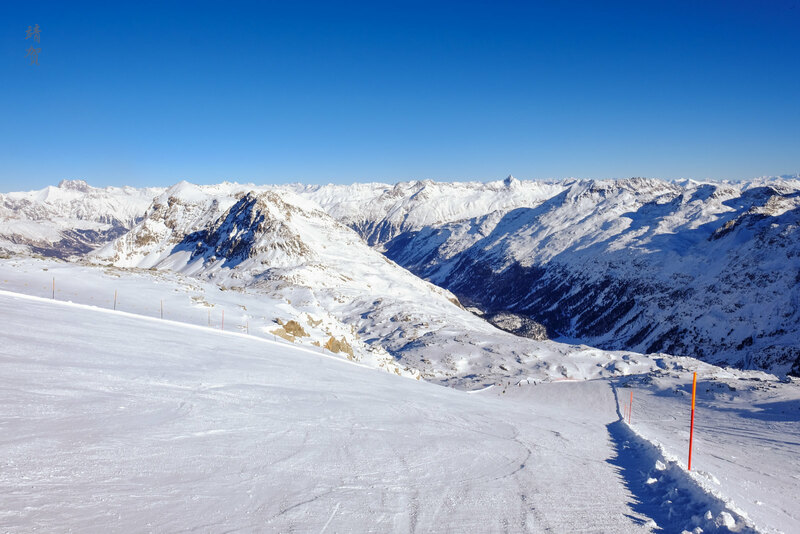 Located in the canton of Graubünden is the world famous ski resort town of St. Moritz. But what most people do not know is that there are several base villages in the area and the ski areas are not formally known as St. Moritz. I stayed in the village of Surlej and it is the main base for the ski area of Corvatsch which has the highest lift-accessible summit at 3,303 meters. 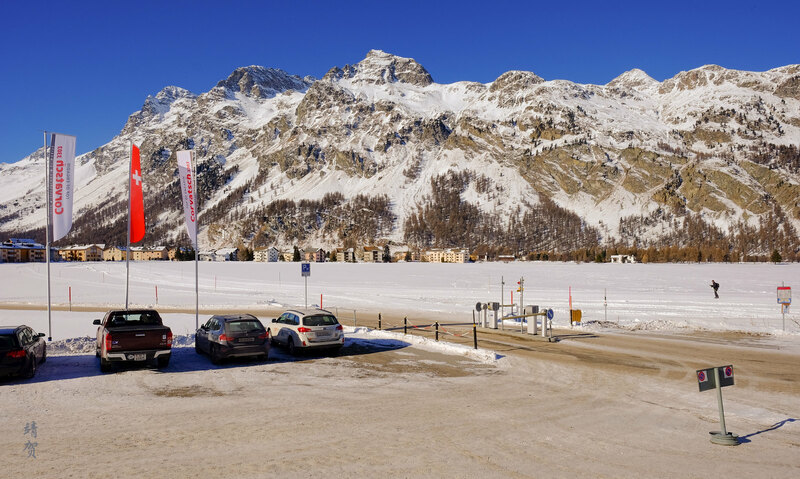 It is usually possible for skiers to ski back to St. Moritz Bad from this area or skiers could take the bus between the villages which is of no charge when you are wearing your ski gear. Otherwise a fee to ride the bus applies. 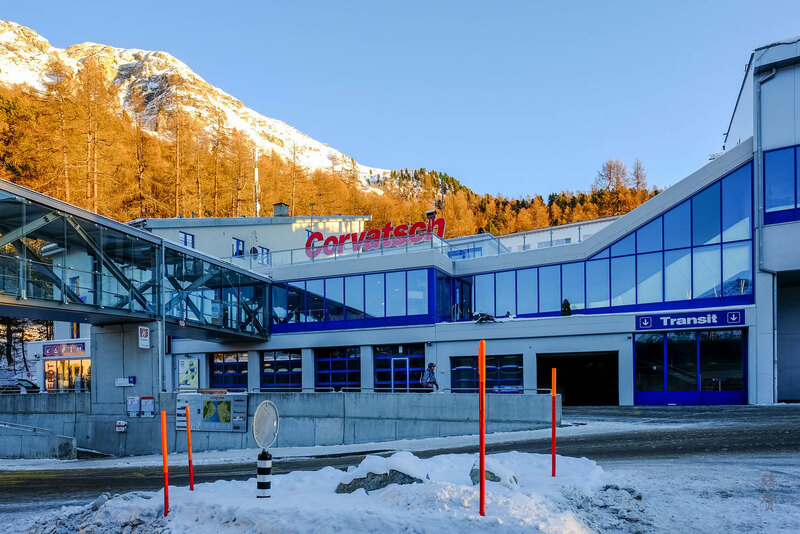 The major railway station here is in St. Moritz Dorf, though the railway line has stops in Celerina and Bernina-Diavolezza which are 2 other bases with cable car/gondola systems for skiers to access the mountains. From either of these train stations, buses have regular services during the times the ski lifts operate to reach other parts of the Engadin. 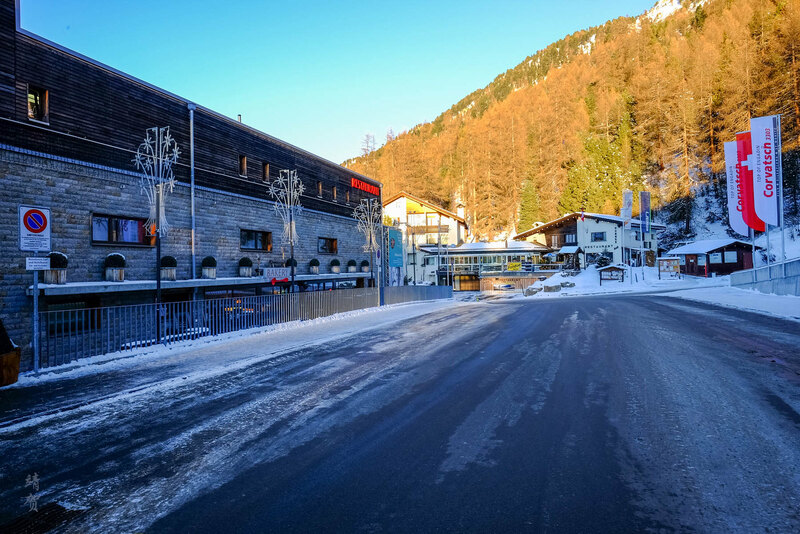 Otherwise skiers could drive to Surlej and park at the sheltered parkade just underneath the Nira Alpina and across from the gondola station. There is an open air car park across from the ski boutique where there is a bus stop that might offer cheaper parking. While there was plenty of spaces to park when I was there, I do find many skiers just take the bus and skiers do have to note that many ski resorts in Europe actually has free parking so it is considered an added cost for skiing in Corvatsch. Considering Corvatsch alone, the number of chairlifts and cable car here is a bit less than the average European ski resorts. For the morning start, most skiers start from the Surlej base station where an aerial tram brings them up to the mid-mountain station at Murtel. 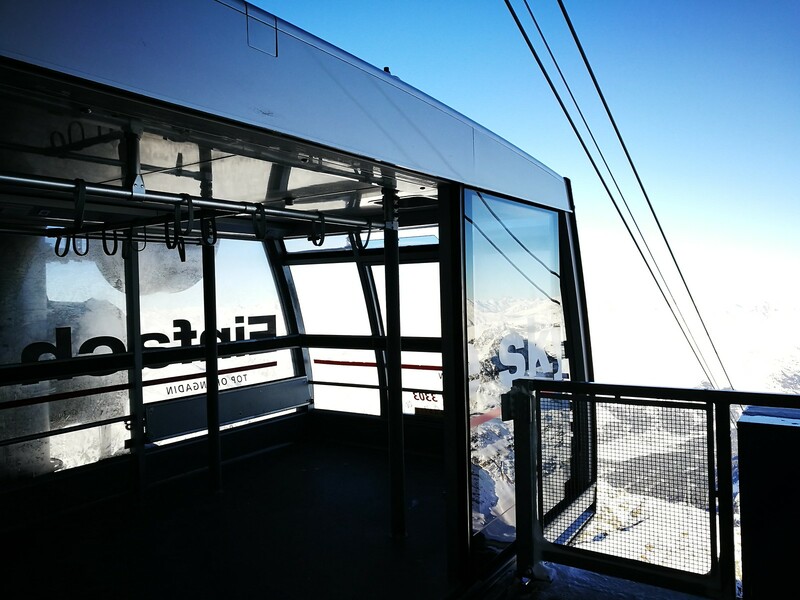 A change of tram brings one up to the peak of the Engadin where the views of the lakes and St. Moritz are amazing. On the other side of the mountain, another tram departs at Furtschellas base near the town of Segl-Maria. The Furtschellas ski area is smaller and has less of a view. 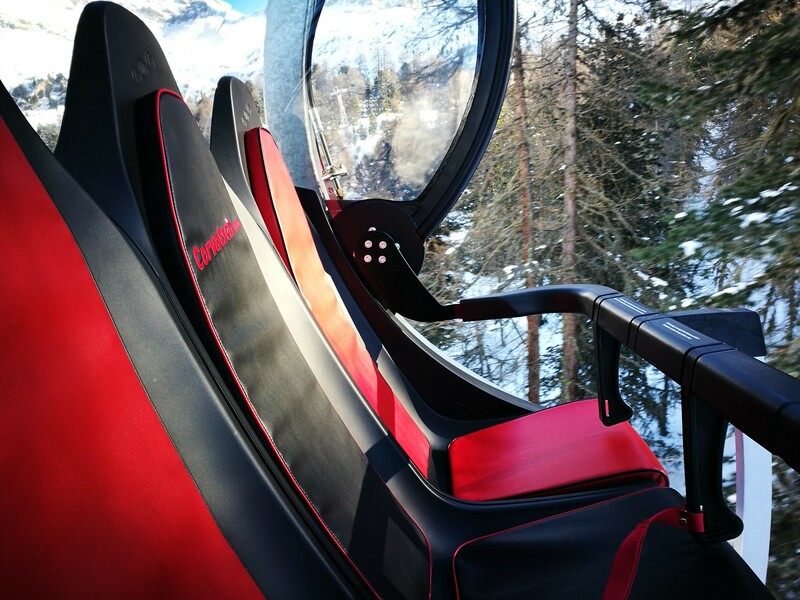 The most impressive chairlift here is perhaps the new 6-seater Curtinella chairlift that has leather upholstered bucket style seats with capsule covers to shield from the wind. This was the most comfortable chairlift I have ever sat on! 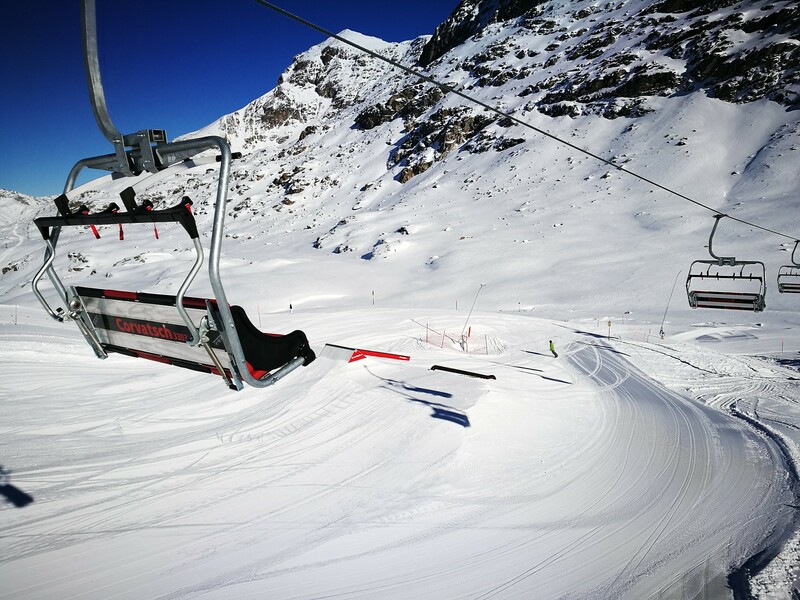 Besides that there are 3 other quad chairlifts, one that brings skiers back to the mid-station with views over the Corvatsch terrain park, the Alpetta chairlift that connects Alp Surlej and Hossa Bar with Murtel. 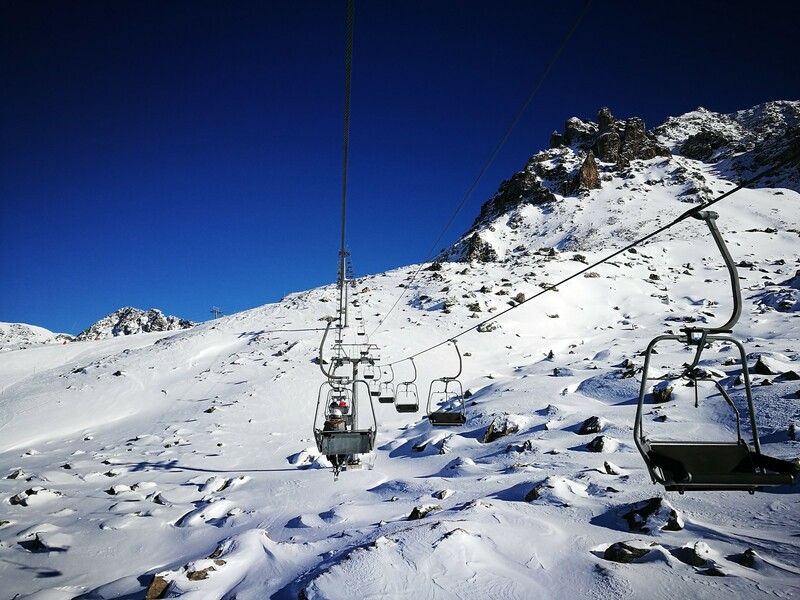 Finally there is a 4-seater chairlift that connects the Furtschellas mid-station with the peak. Other than that there are some dual-seater chairlifts, and the Giand’Alva chairlift would allow skiers to ski down the black-marked Hahnensee run into St. Moritz Bad but skiing down here would mean taking the bus back to St. Moritz, take the tram to Corviglia (the other mountain) or take the bus back to Surlej. 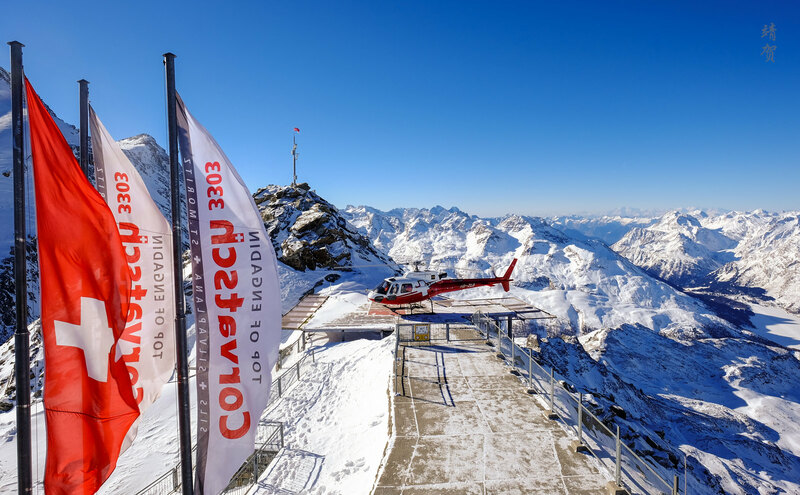 Prices to ski Corvatsch or Corviglia are CHF79 (~$82) for a day, CHF69 for a half day (from 11:45am) and there is an afternoon ticket for CHF49 (from 2:15pm). 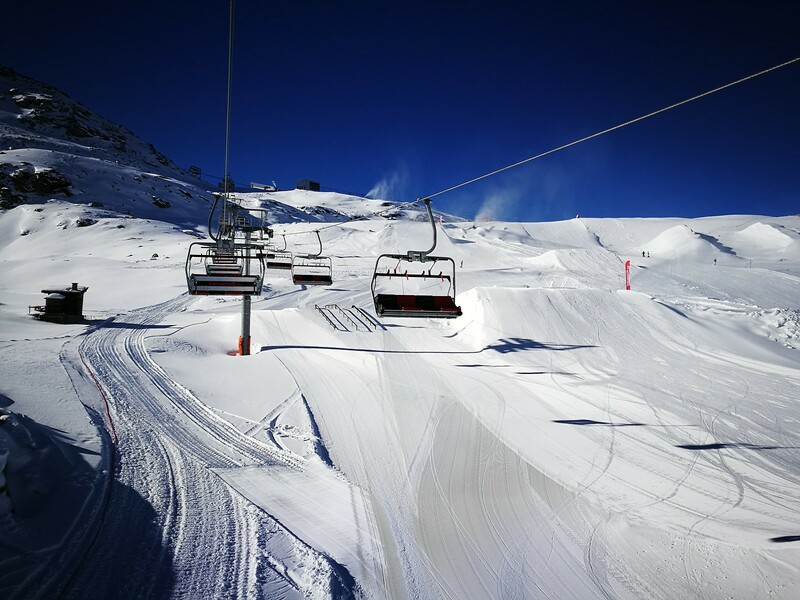 For those planning to ski more than one day, there is a multi-day pass allowing access to all the resorts in Engadin St. Moritz (Corvatsch, Corviglia, Diavolezza/Lagalb and Muottas Muragl). A 2-day pass to all the resorts costs CHF156 (~$162), while a 3-day pass retails for CHF223, and a flexible 3 day out of 4 pass sells for CHF235. 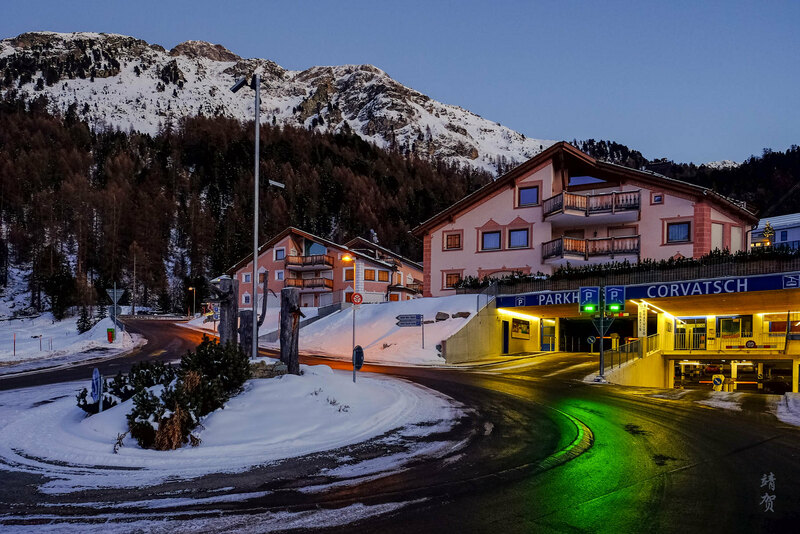 However as I was staying more than one night in a St. Moritz area hotel, I was entitled to purchase a hotel skipass for CHF35 per day. The conditions for this is that I had to purchase a 5-day pass as I was staying 5 nights. At CHF35 per day it was great value to be able to ski here but I would not consider paying the full ticket price to ski Corvatsch. 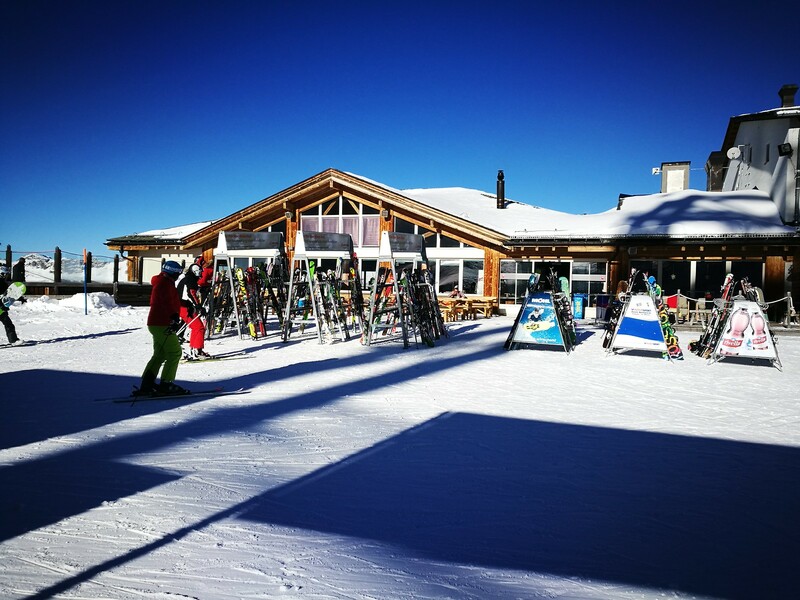 Those new to skiing have access to a learner’s area served by the Cristins T-bar below the Surlej base station. 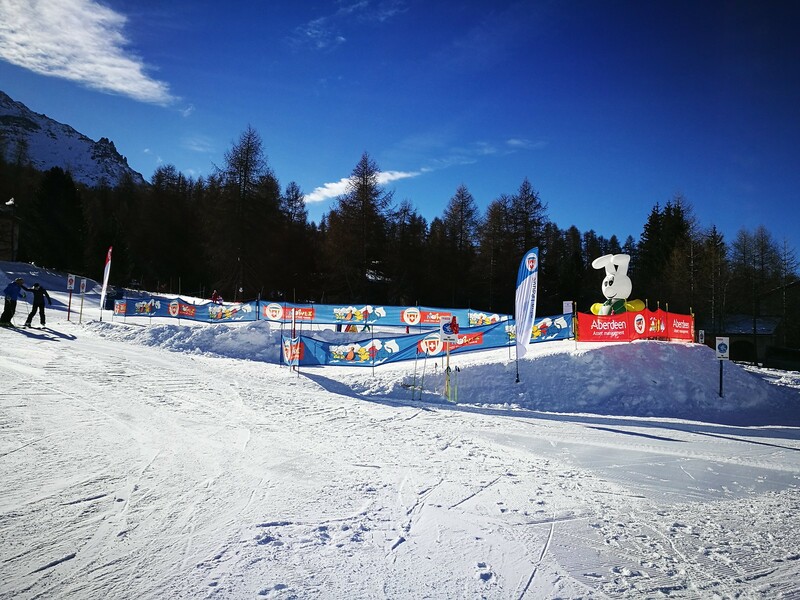 This section dedicated to learning how to ski is located beside the Nira Alpina hotel and allows parents to supervise their kids easily if needed. Beginners could also stop easily for a break anytime they want. In addition to the learning section, there are easy runs underneath the Mandra chairlift and accessible from the Murtel mid-station. There is also an easy blue run from the Furtschellas Bergstation (summit of Furtschellas) to the Chüderun. Plenty of trails here are marked red with the red trail leading from the top of Corvatsch being the highlight as it runs parallel to the glacier at the upper first section. Another long piste to enjoy here is the Chastelets trail from the top of the Murtel right down to the village. For shorter ski trails, the one below the Curtinella chairlift is unbeatable especially when the chairlift is a comfortable ride up! Nearly all of the intermediate ski trails provide plenty of speed and would only be good for beginner intermediates if there is fresh snow. All the runs leading to the base of at Furtschellas and Surlej are red-marked but the lower runs can be quite narrow and icy at times. This means that skiing down all the way is best left for more skilled intermediate skiers. 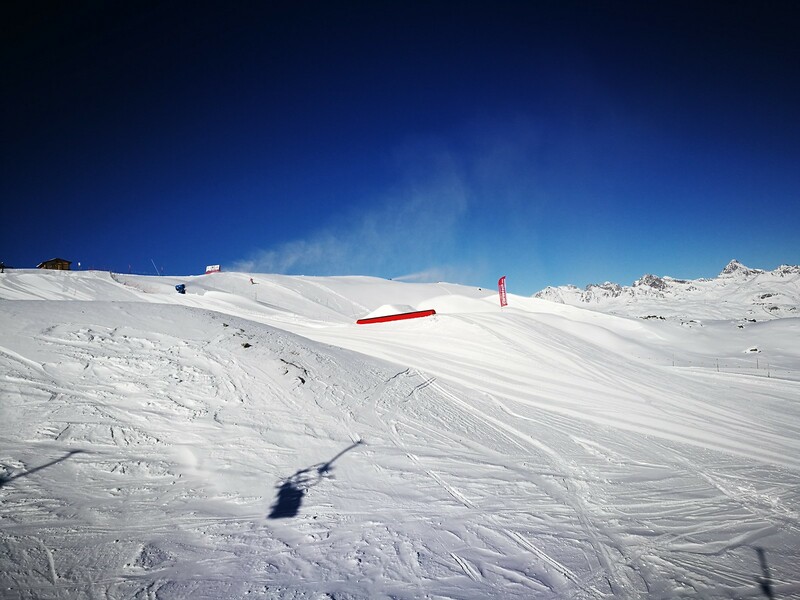 Corvatsch has a total of 2 marked black runs. One of them is the Hahnensee run that leads to St. Moritz Bad but it was closed due to lack of snow when I was there. The other black run is the short Lejins run crossing through the Murtel T-bar. Other than that the lack of any backcountry terrain and large bowls means this resort is not very suitable for expert skiers and riders. The Corvatsch Park can be found just off the Mittelstation Murtel and runs parallel to the Mandra ski trail, served by the Mandra chairlift. It looks to be a relatively well maintained terrain park with pipes, rails and well groomed ski jump areas in increasing modes of difficulty. 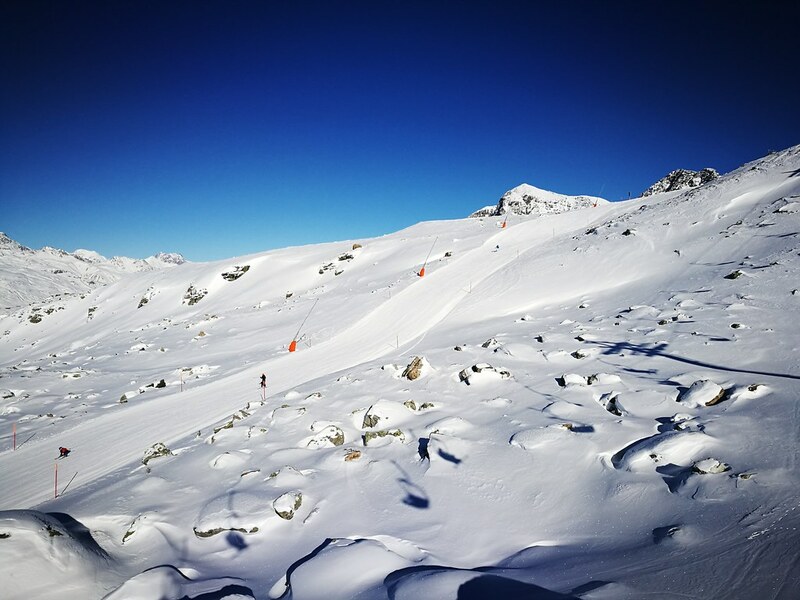 The sunny weather here makes it easy to enjoy the terrain park and this could be one of the reasons to ski in Corvatsch instead of Corviglia while in St. Moritz. Considering the limited number of runs and chairlifts in the resort, there are plenty of ski lodges for skiers to take a break. The most obvious would be the Mittelstation Murtel which has all the facilities including a ski school and ski gear shop. There is also a restaurant and bar beside the station. 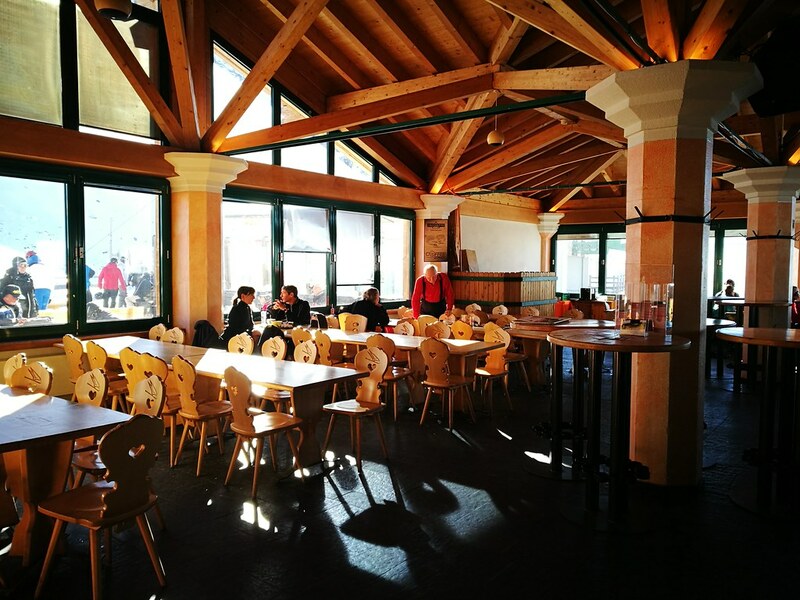 The summit station (Corvatsch Bergstation) has a good range of facilities too including a gift shop and a restaurant offering panoramic views for day trippers. On top of that there are ski huts located along the Chastelets ski trail, and at the base of Alp Surlej and Curtinella chairlifts. At the Furtschellas side of the resort, there is a lodge at the Mittelstation (midstation) above the Sils-Furtschellas aerial tram and by the bottom of the Rabgiusa. 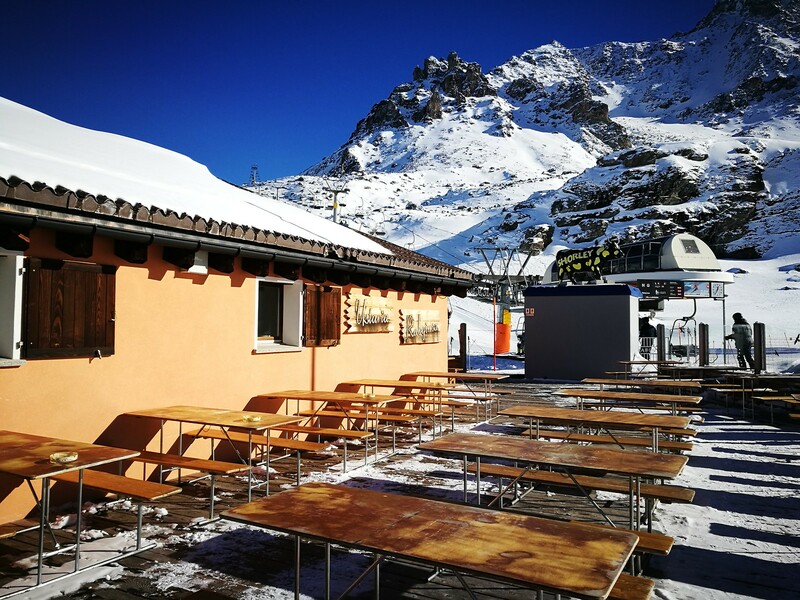 When all the runs are open, there is a ski lodge even at the Fuorcla Surlej along the Fuorcla piste and a lodge along the Hahnensee run. With many of these lodges having an outdoor patio and serving wines and beers, skiers can take advantage to rest along the way. It seems the case of skiing here is to cruise and enjoy every minute of the way and not about who gets to the bottom first! The type of cuisine served in Corvatsch is somewhat different from those in Austria or Zermatt. Over here, there are more Italian dishes like pizzas and variety of pastas, polentas and prosciutto. 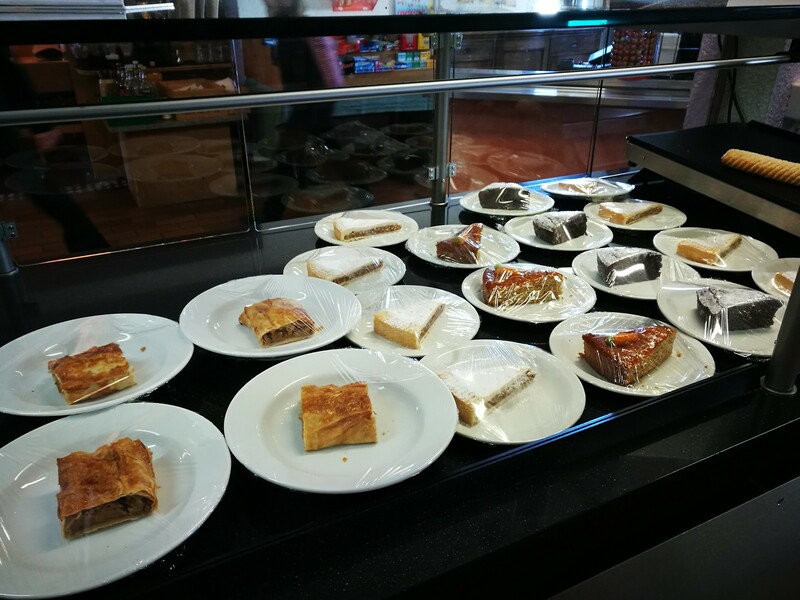 But like many European ski resorts, they have a very good selection of desserts with various cakes and tarts to choose from. 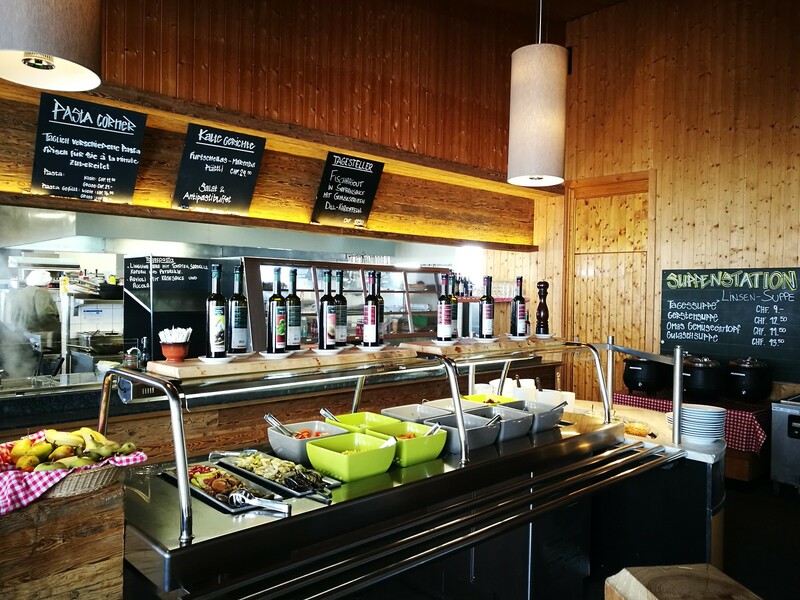 Dining on the lodges can be quite expensive though with prices for appetizers and salads ranging from CHF9-15 (~$8-14) and pastas and other main course costs between CHF17-27 (~$16-25). Add in desserts and wine and you are looking at the cost of a meal in a nice restaurant in most major cities. If your plan is to ski in Corvatsch, Nira Alpina where I stayed in is probably the best as it offers ski-in/ski-out access and have a direct walkway from the hotel to the gondola station. Prices for accommodations in Surlej is usually cheaper as well compared to staying in St. Moritz proper. Aside from that, Surlej and neighbouring Silvaplana has several less known ski hotels offering lodging by the week. There are also apartments for rent for guests seeking longer term accommodations. Perhaps due to the limited number of skiers in Corvatsch and the fact the lower slopes gets covered in shadow and becomes icy in the afternoon, the ambience is very quiet when the ski lifts winds down for the day. There is no partying as skiers head for the bus with the party going elsewhere. While the lodge in the Mittelstation Murtel sees some skiers unwinding with a beer or wine, the base village in Surlej is a scene of calm and serenity even in the evening. If there was one thing that is true, the views here surely is the top! Tagged as the ‘Top of the Engadin’ the panorama from the Corvatsch Bergstation is impressive as it offers views of both lakes Segl and Silvaplana along with the town of St. Moritz. 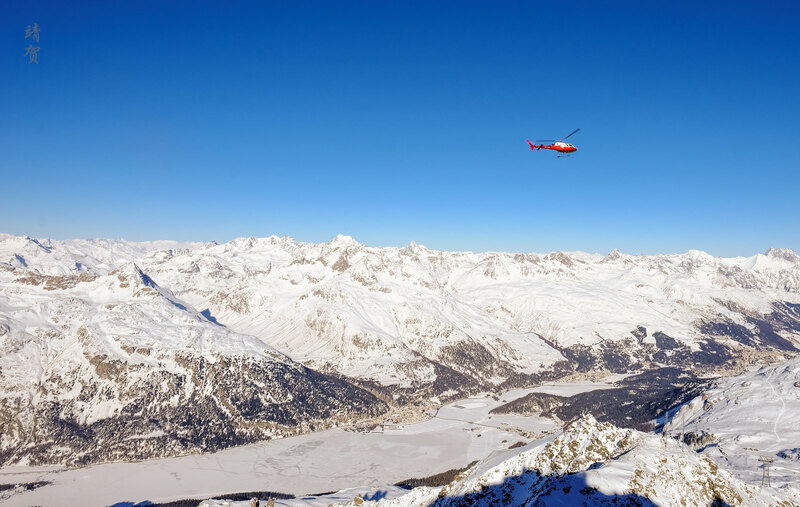 Visitors travelling to St. Moritz definitely should come up to the top of Corvatsch even if they do not ski as the views here are one of the best in the area! For advanced skiers and those looking to do more skiing rather than leisure cruising, there is not much that Corvatsch can offer. With lacklustre snow and an orientation that makes it icy in the afternoon, the resort is limited in offering all day skiing. This is also no place for skiers with more energy left for a party. 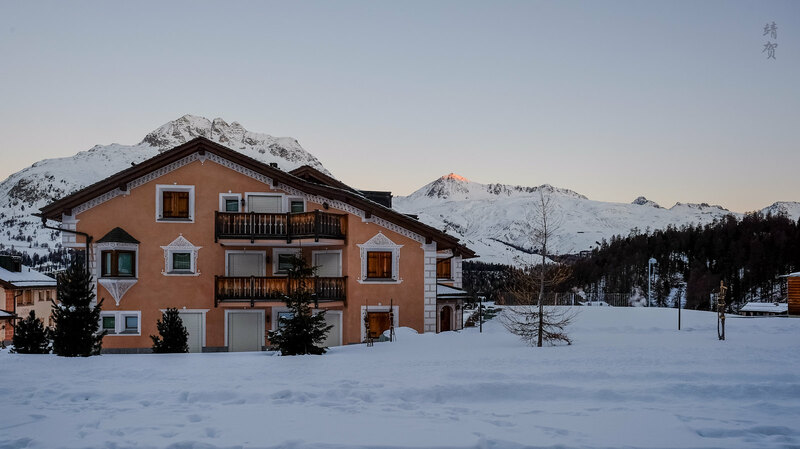 As such, I find this resort provides limited reasons to come and ski aside from the views and the comfort it can provide for families or leisure skiers. Even then, leisure skiers could probably get better skiing elsewhere in Europe. My verdict? 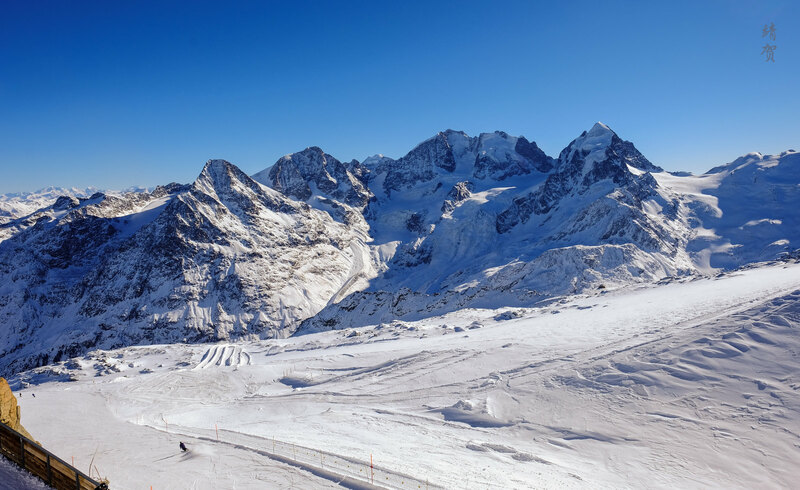 Limit yourself to one day of skiing here and explore the other ski areas in the Engadin St. Moritz.